When you make handmade decorative accents for your home, you can end up spending a lot of money at a craft-supply store on the materials for your project. For example, you may buy bleached oyster shells for a beach-themed home accessory. Instead of buying pre-bleached oyster shells, bleach your own oyster shells using a few basic materials that can be purchased inexpensively from a supermarket. This enables you to make beachy home accents on less money. Put on rubber gloves to protect your skin from the bleach water. Fill a 10 gallon bucket halfway full of water. Pour 1 cup of unscented bleach into the water. Stir the solution for 1 minute using a long-handled spoon. Place up to 2 lbs. 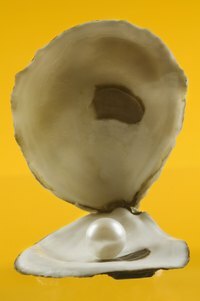 of oyster shells into the bleach water and push the shells under the water using the long-handled spoon. Allow the shells to remain in the bleach water for 30 minutes. Rinse off the bleached oyster shells under clear water for 2 minutes, then lay the shells onto a towel to air dry for 3 hours. Keep bleach out of the reach of children.